I got a great email the other day from Henchman Miniatures where he showed me how he put the Word Bearer tutorial I posted the other week to use. Since I thought he did a great job with it, I figured I'd share what he was able to do here. 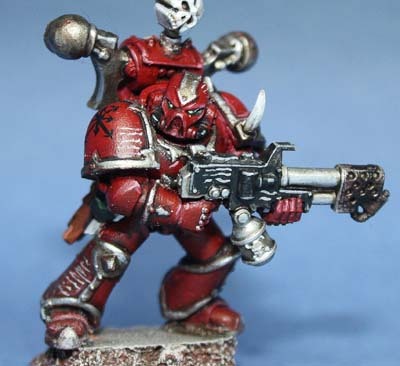 The picture above is his finished model and I think he was able to capture the perfect shade of red on his Word Bearer. There are tons of ways you can paint red and it almost always comes down to one thing in particular... what shade of red do you prefer. Then it's just a matter of finding or developing the technique to get that certain shade without driving yourself crazy in the process. I've got my fair share of red techniques as well. Looking back now, I might have done better to mimic my Flesh Tearer technique to get a closer red, but I would not have been able to use the quick spray paint method that I ended up going with (and that was a specific request I got from a reader). 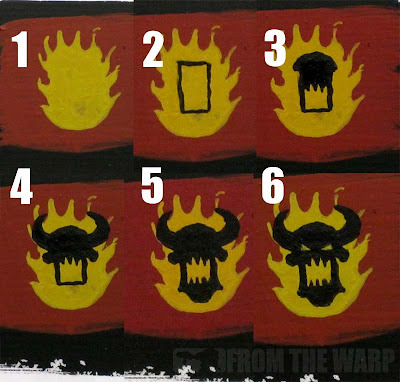 I posted the step by step I used to break the symbol down into manageable parts. Not anything earth shattering, but a different way of seeing things and using an overlapping style to create a complex design instead of trying to paint it in one pass with all its complexities. 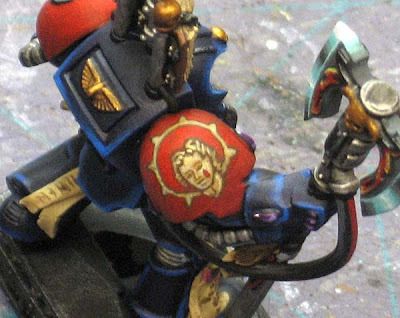 Here's the chapter symbol he freehanded onto the shoulderpad of his model. I like that he made some changes and turned the horns down in addition to giving the flames a little more life. He even went as far as to shade the bottom of the flames with orange leaving the tops yellow. It's a subtle change, but a nice one for something like this. Freehand work like this is not without it's dangers. When you do freehand work over a base color that has already been shaded and highlighted (giving you an uneven surface in terms of color consistency to work on) you need to be confident and very careful. I mentioned this once before a while ago in this post and it's worth repeating here. There are certain things you'll be able to do and certain things you'll have to work around all depending on when you apply your freehand to your model. And sometimes, that decision (when you will do it) will be based on how you're painting your model or the particular process you're using. All that being said, don't let freehand scare you. Once you can break down your image into manageable shapes and you know what kind of surface you'll be working over, you shouldn't have any trouble at. 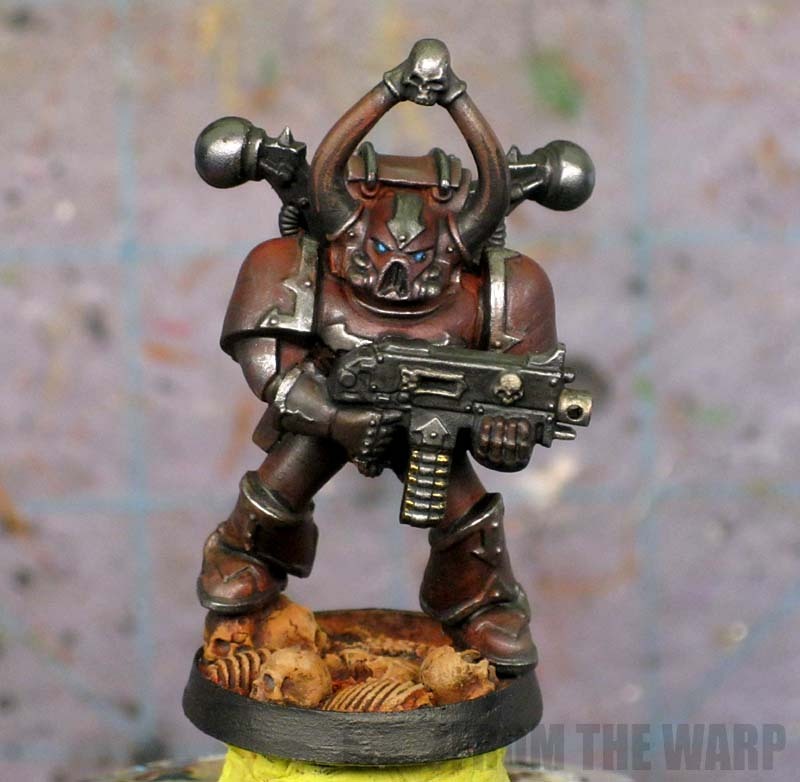 A perfect example is that Word Bearer marine that Henchman Miniatures painted up. 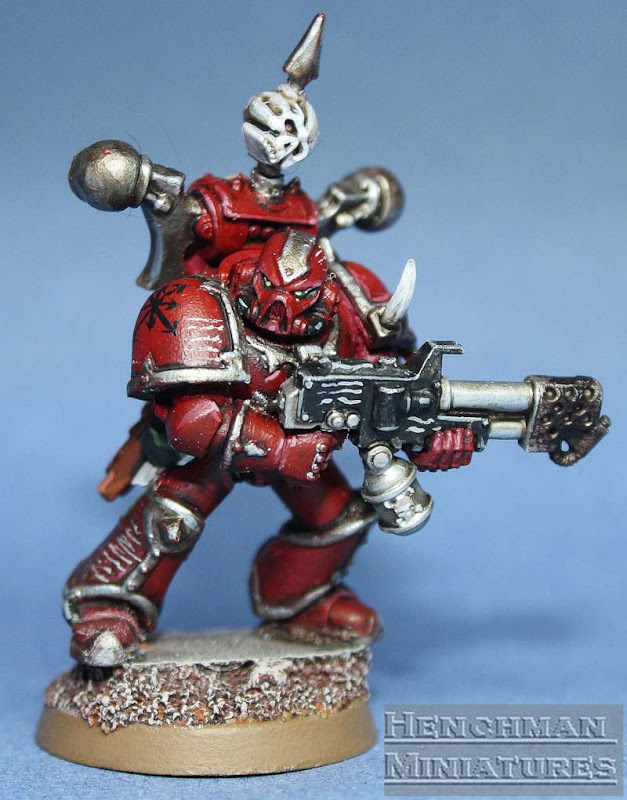 The brighter red works better for Word Bearers in my opinion. Khorneguy: See, I like the more muted/darker red myself. At least you have a breakdown of the symbol now to help with your warband though. Ian Logsdon: Excellent. And I like that you took it and modified it slightly to get the result you like. How the heck do you paint so weel so quickly?!! It takes me a week to do one squad member. As always: top notch work, Ron! Both look great, though I like the darker brown, like dried blood, look more for Word Bearers. 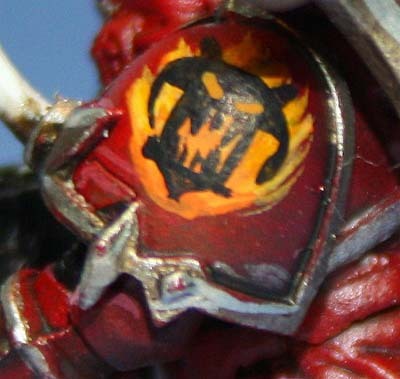 The brighter red looks more Khorne Berzerker / Blood Angels to me. Thanks for sticking this up, it's made my evening! It's an honour to see my work displayed next to yours. Green Stuff Industries: I cheat. Thanks! Hudson: Thanks, but I think Henchman Miniatures has a better shade of red for his Word Bearer. GaryWilson: Thanks for sharing your stuff with me. I think you did a great job and wanted to show others. Muskie: Very nice! I like the depth in the red you have there. Sometimes, my reds seem to go flat on me.